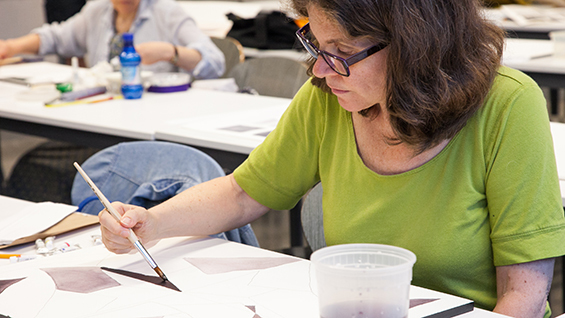 This five-day workshop enables students of all levels who want to paint an opportunity to become familiar with the three most popular water media: watercolor, gouache and acrylic. Through a step by step approach consisting of demonstrations, guided exercises and painting assignments you will become familiar with the unique characteristics, advantages, and limitations of each medium so you can make informed choices between them. Students will learn about: impasto, building layers, creating texture, use of mediums, blending colors and glazing with acrylic, transparency, washes, wet-into-wet, dry brush and controlling hard and soft edges with watercolor, and opacity, color blending and use of flat pure color of gouache. Students will learn which surfaces and brushes are best for each medium, the relative permanence of each, when and how they might be combined for special effects and their suitability for use in different situations. While it is an introductory class, more advanced students will be challenged at their level and encouraged to go beyond. Please bring $20 materials fee, payable to the instructor, to the first class. Students MUST enroll 5 business days prior to the course start date, The final day to register is May 22nd., students enrolling after this date will pay a $15 late fee.